Athens. Greece’s government council for foreign policy and defense (ΚΥΣΕΑ) is to hold a meeting on Wednesday to discuss illegal immigration, Greek ANA-MPA agency reported. At the meeting, which will be chaired by Prime Minister Costas Karamanlis, the council is expected to allow the use of Ritsona drill ground as a center for accommodating illegal immigrants before their repatriation. Apart from the above, the agenda of the meeting and the ways “domestic” and “geopolitical” issues pertaining to immigration interweave are absolutely terrifying (info from this eleftherotypia article). The military wants to form a new – military, of course – service to guard Greek sea borders; the Port Police do not want to compromise their jurisdiction, yet, they are said to acknowledge that they cannot cope with immigrant flows. The issue of Greek military’s “humanitarian” missions in NATO war fronts (in the countries of origin of refugees, that is) will be dealt. NATO puts pressure to the Greek government to contribute more (…). The issue for the Greek government is… to return to a previous regulation under which its military expenditures do not appear in the state’s annual budget (so that theeconomy’s indices look better vis-a-vis the forthcoming elections and to the EU’s superintendence). In a similar vein, the minister of defense put pressure on the EU to exempt the military (“humanitarian”) expenditures from the calculation of the trade deficit, since much of it is due to these military expenditures. 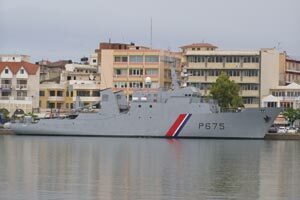 A French Navy ship, the PSP Arago, has completed what is reported as the Navy’s fifth Frontex mission. 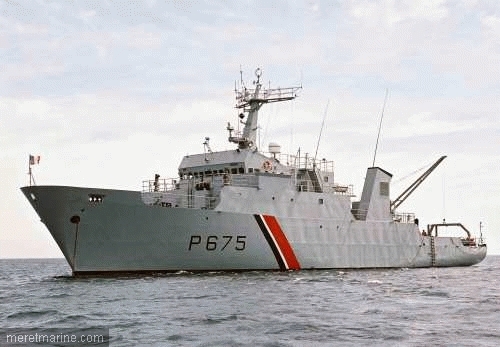 The PSP Arago was based in the Aegean Sea 3-29 June 2009 and operated out of several Greek ports. It reportedly intercepted over 200 migrants in 7 interdictions; the migrants were turned over to Greek authorities. French naval ships have participated in Frontex missions since 2008. French naval surveillance airplanes have participated in such missions since 2006. Click here for article (Le portail des sous-marins). 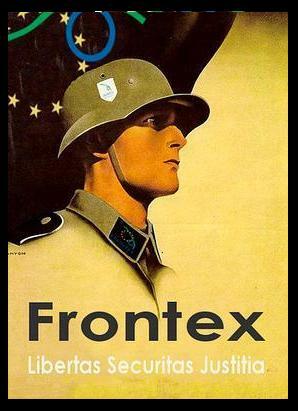 Click here for the Préfecture maritime de la Méditerranée web site: Intervenir – Participation aux missions Frontex. Since two days a new boat working for Frontex is in the Harbour of Mitilini. 40 officers will stay for 1 month for the Operation Poseidon-trying to keep refugees away from the greek coast. Also an Austrian helicopter is expected the next days to take part in the operation. The polish airplane that took part till end of may at the operations in Lesvos. The tourists may be schocked seeing it at night hunting refugee boats with its lights in the sea!!! …The policy of degrading immigrants works just fine, the point is how money is shared between states, police agencies etc. This is an article we found here…Bold fonts are ours. ATHENS, Jun 1 (IPS) – United Nations High Commissioner for Refugees António Guterres has asked the European Commission to call a meeting between the agency and countries around the Mediterranean to work out a joint strategy to deal with irregular migration. Guterres has proposed a meeting between Italy, Malta, Libya, the United Nations High Commission for Refugees (UNHCR) and other partners following Italy’s recent ‘push-back’ of migrants to Libya. But while Italy is being internationally chastised for the refoulement of refugees that effectively annuls the country’s responsibilities arising from international treaties, most notably the Geneva convention, neighbouring Greece is building up state-sponsored persecution of irregular migration that has gone largely unnoticed. Since 2005 when traffickers shifted from the worn-out Spanish and Italian routes to less guarded ones, and the influx from devastated states like Iraq and Afghanistan multiplied, the number of migrants crossing into Europe through Greece has skyrocketed. 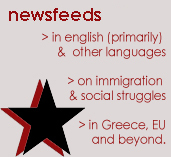 Rising social closures and anti-immigrant institutional arrangements in Europe, most notably the Dublin II regulation, have led to an increased concentration of migrants in Greece. Under the Dublin II regulation asylum applicants must register their data in the first country where they come in contact with authorities. It becomes that country’s responsibility to assess their status thereafter, and anyone moving to another country would have to be sent back to the country where he or she was initially registered. Dublin II has been widely criticised by human rights activists as a device to raise the walls of ‘Fortress Europe’, and for developed states to reduce their responsibilities at the expense of border states. In less than five years hundreds of thousands of migrants have gathered in an overburdened country that has no experience in dealing with a migration influx. Greek politicians have no idea how to adapt policies to a newborn multicultural environment – and no will to do so. 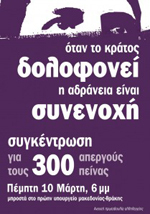 Since 2000 all Greek administrations have avoided implementation of European directives on reception, asylum procedures, family reunification and long-term residence status, despite their incorporation in national law. According to the Greek Ombudsman on migration, viable economic activity for economic migrants has been denied, pushing them into the vast and ruthless informal market as cheap labour. Second-generation migrants have been socially isolated. On their 18th birthday they fall into a limbo of semi-legality that threatens them with expulsion to their parents’ country of origin – where they may never have been. Not least, Greek authorities have denied access to asylum and refugee status by politically directing approvals to below 1 percent, and refusing claims for refugee status made on humanitarian grounds. Responsibility for controlling the irregular flow of migrants and regulating asylum and refugee issues has been placed with the police, notorious for their abysmal human rights record. “Asylum has been completely abandoned,” Spyros Kouloxeris, coordinator of the legal assistance programme of The Greek Council for Refugees told IPS. But the government is headed the opposite way. With encouragement from mainstream media producing hysterical reports on migration, the government is considering a response that advances policing at the expense of integration. This will be assisted by an additional budget of 200 million euros for the police up to 2013, 148 million euros of which will come from the European Union for policing equipment and new technologies. It is in this climate of fear that many migrants gather in the central districts of Athens or in slums around the ports of Patra and Igoumenitsa that provide sea links to Italy. Desperation at these places has led to increased criminality, and created lawless zones. Rioting by Muslim migrants after reports of the desecration of a copy of the Quran by a policeman show that the situation is explosive, and requires quick and deep political response. “Perhaps these incidents are a taste of the future,” Thanos P. Dokos, director-general of the Hellenic Foundation for European and Foreign Policy (ELIAMEP) wrote in Kathimerini, a major political daily. Many are now looking to the “Stockholm Programme” on freedom and justice, now that Sweden has taken over EU presidency for the second half of this year. The programme will address migration and asylum issues. (END/2009) . Turn off the Stockholm Programme – No Future for the ‘Future Group’! Following Tampere 1999 and Hague 2004, the EU plans to decide the next five-year plan on “Justice and Home Affairs” (JHA) this year. After the implementation of data retention and new databases, the creation of “Frontex” and the “European Security Research Programme” , the “harmonization” of terrorism laws and more surveillance of the internet, next severe changes are foreseen to bet set in the new guideline. Under swedish EU presidency in the second half of 2009, probably in November or December, the ministers of interior and justice will meet to agree the new “Stockholm Programme”. An EU population register, ‘remote’ forensic searches of computer hard drives, internet surveillance systems, more implementation of satellites and ‘drone’ planes for surveillance, automated exit-entry systems operated by machines, autonomous targeting systems, risk assessment and profiling systems, e-borders, passenger profiling systems, an EU ‘entry-exit’ system, joint EU expulsion flights, dedicated EU expulsion planes, EU-funded detention centres and refugee camps in third countries (even “overseas”), expansion of the para-military European Gendarmerie Force, deployment of EU Battle Groups, crisis management operations in Africa, permanent EU military patrols in the Mediterranean and Atlantic, more power for EU agencies, interlinking of national police systems, an EU criminal record, a permanent EU Standing Committee on internal security (COSI) dealing with operational matters, more partnerships with the security industry. By 2014, the ministers wish to establish a “transatlantic security partnership” between the EU and USA, that can be seen as a kind of domestically NATO. NATO strategists on the other hand approach to internal politics by claiming in the paper “Towards a grand strategy in an uncertain world” that military could only supply “strong defence” if there is a “strong homeland security”. The blog http://stockholm.noblogs.org tries to collect calls, background texts, links, dates and material in different languages for campaigning against the meeting in Stockholm.